I had just 3 months to go before my wedding and I was struggling to lose 12 pounds. I had seen a co-worker who had fast and dramatic weight loss results and I asked her secret. I lost my sister to a stroke at age 40 and I knew that I needed to get my weight under control. My experience with Lacole Broadus started with my plea for help to lose just 10 pounds. Lacole told me that I didnâ€™t know who I was inside. In the end, I lost 65 pounds. As I began losing weight, my confidence and outlook on life also began to change. I felt empowered and have made other changes in my life; for example, Iâ€™ve recently embarked on a new career as a financial advisor. I realized that I could do anything that I committed myself to do with the right support. I had tried other weight loss programs but had little success. Lacole was the key to accomplishing my body transformation. She is kind but diligent and worth her weight in gold. With Lacole, I went further than I ever imagined in achieving my body transformation. I had been working out with Lacole for about a year and had lost over 50 pounds. I was only 10 pounds away from my goal weight and the fitness retreat helped me to finally achieve this goal. Not only did I lose pounds and inches but I also gained muscle definition. I had a wonderful time at the treat eating healthy, working out three times a day and fellow shipping with an amazing group of women. I need to do this retreat annually so that I can refresh myself mentally, emotionally and physically. Lacole is an amazing "life coach"!!! I thank God for bringing her into my life! Before I attended the Fitness Compulsion Retreat I wasn't sure if I had made the right decision to get myself back on track with my health. I thought that I would be able to do it on my own. I thought I had my bad eating habits under control. I ate a lot of unhealthy snacks, drank soda, and ate a lot of unhealthy heavy foods all the time. During the retreat Lacole helped to reprogram our bodies by working out with us 3 times every day, she taught us how to eat healthier, and she had informational sessions on living a healthier life. The results were amazing!! I couldn't believe how much weight and inches I had lost during that week. The Retreat helped me boost my self-confidence and shed light on me wanting to continue to taking care of myself the right way. It was one of the best decisions I had made for myself. It made me realize that I can live a happy and healthier life!! Thank You!! Thank You! Thank You Lacole!!! I have done personal training sessions with Lacole, but this fitness retreat was the first I had ever been on. Being able to eliminate all other distractions and focus just on training in a relaxing setting in the mountains really helped me to stay motivated and kick-start my fitness goals after the holidays. As an entrepreneur in the highly demanding entertainment industry, it was challenging for me to stay focused and committed to exercising and eating right, but after attending the retreat, I have been able to maintain an improved diet and regular exercise. For anyone who has fallen off of regularly exercising and wants to restart a fitness regimen, I highly recommend attending an upcoming fitness retreat with Lacole. It was not long after I started working out with Lacole that I realized, how profoundly what I was learning from her was changing my life. Not only did I shed pounds and inches but I felt healthy and fit for the first time. No longer is "but, I can't do that" an acceptable thought in my fitness routine. I have been liberated from my couch! Thank you Lacole! I trained with Lacole for about 2 Â½ months from June to August 2011. During that time, I lost 24 lbs in 30 sessions, which is phenomenal. However, what is much more important is that I learned to develop a fitness and nutrition regimen to sustain not just the weight loss, but a healthy lifestyle over all. For me, weight loss was not my primary goal, but just a byproduct of learning to engage my body, while elevating my understanding of the fuel needed for it to function optimally. I have employed trainers before; however, what made Lacole unique is that she married physical training with nutrition. The combination of these integral pieces is what makes the difference and yields sustainable results. Whatâ€™s more, Lacole taught me that I can do it all extremely effectively in the comfort of my own home with very minimal equipment. No excuses for not being too tired to go to the gym! While I do have a gym membership that I use primarily for classes, I know now that I do not need all the fancy, expensive equipment collecting dust at my house to get a good and thorough work out. All my workout equipment at home fits neatly in a medium size container behind my couch. Since August, I went on to lose an additional 13 pounds on my own, now weighing in around 116 lbs, size 0/2 (with curves). I have tapped back into my inner dancer/athlete with fierceness that I did not know I still had and it feels great! I am back to my â€œreal sizeâ€ and I am in better shape now than I was in high school as a track athlete and dancer over 20 years ago. I engage in a myriad of different work outs and dance classes six to seven days a week. And before anyone thinks I am over the top, I found that my body now craves physical challenge that also produces mental and spiritual benefits. I love every minute of the journey! Working with Lacole, if nothing else, gives you a good foundation for you to take it to the next level. The tools are there, you just have to make the decision to put in the work in order to reap the benefits. It is a new and better way of life. God has blessed you with your temple. Now it is your duty to restore, preserve and energize the gift you have been given. â€¦and you never know, you may even find a new passion! This letter is an unabashed testimonial to Lacole Broadus. I cannot praise her enough. I can only call her to your attention as the person that has made Babyland so valuable to me. I highly recommend Lacole to anyone interested in turning their lives around through strength training and healthy eating habits. I lost my sister to a stroke at age 40 and I knew that I needed to get my weight under control. 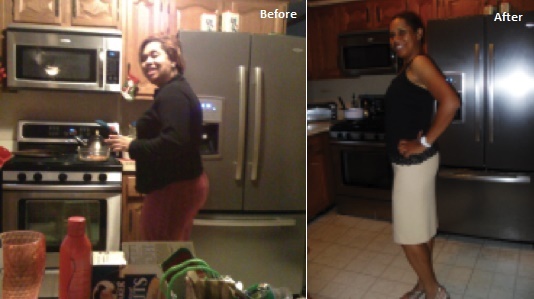 My experience with Lacole Broadus started with my plea for help to lose just 10 pounds. Lacole told me that I didnâ€™t know who I was inside. In the end, I lost 65 pounds. As I began losing weight, my confidence and outlook on life also began to change. I felt empowered and have made other changes in my life; for example, Iâ€™ve recently embarked on a new career as a financial advisor. I realized that I could do anything that I committed myself to do with the right support. I had tried other weight loss programs but had little success. Lacole was the key to accomplishing my body transformation. She is kind but diligent and worth her weight in gold. With Lacole, I went further than I ever imagined in achieving my body transformation. After having undergone several back surgeries, Lacole's Fitness Compulsion Band Out workout helped me begin to re-tone my muscles at my own pace, without fear of damaging my back. Her diet plans allowed me to get back in shape in a healthy manner, no fads, no gimmicks-JUST RESULTS!